This is meant for folks who can use them. Sending them to folks who “plan” on flipping them (because these are very expensive lights) is NOT the reason I am making the offer. (open to shipping any odd quantities) The master shipping cases dissolved first, so I’m planning on shipping “smaller amounts” USPS medium or large flat rate boxes, still working out qty per. And/or UPS for larger qty (would like to serve as many folks as possible but #1 objective is to just make them disappear. Just so you know they way I tested them is I bought Cheap GU24 to E26/7 adapters for a $1-$2 each so (adapters not included) then these can be used in “normal bulb sockets” That is how I tested them. But allow for a 5 inch long bulbs plus adapter if used and a 5 inch wide bulb so some fixtures will be too small. For example not good with lamps with shades (true, but LOL). Bulbs will be weighted and prioritized in order of posted responses (below)/finalized count, acceptable degree spec, address and payment also matter. Will try to stay with first complete order first served. (“cases” no longer available, all orders on an individual basis. actual project size matters). Please include quantity desired (meaning count your fixtures or project plan for total used) and preferred beam width (and also if beam width is a deal breaker) in PM, will respond to each member separately. Will close or remove posting when out of stock. So as long as you see the ad I am still making orders. I'll take a case. PM incoming. Thank you. EDIT: Given the update to the OP, I have reduced the quantity requested. I’ll take a case too! Thank you!! I’ll take a case if ya still got, tnx! Wide/flood preferred, but either is fine. Track lighting, over a dozen fixtures over the whole length. Given the update to the OP, I have reduced my requested quantity. Thank you again Ronin42. Gutting and rebuilding our kitchen. PM sent. Need more projects where 25 Degree is OK.
I’ll take a case. PM incoming. Thank you. Your Nurmero Uno happy recipient. Alex Sorry to hear the PAR38 will not work for your project, but thanks for checking ahead of time. Oh man! I so wish these were “regular” style GU24 bulbs! I have a ceiling fan that uses GU24 CFL’s and I’ve looked for LED replacement bulbs, but they are, indeed expensive. This is a wonderful gift you’re giving away. I wish my lights could use them. David I know just enough to be dangerous about bulbs. How are these non standard GU24? Could you be wishing they were PAR 30 instead of PAR 38? Or “regular” E26, E27 thread in Edison? Yeah, I meant “regular” like Edison style screw-ins but with the GU24 base. What I have now is a light fixture that uses 4x CFL “twister” bulbs that have GU24 base. They are the size of a “regular” light bulb. What you have are what we call “can light” or “track” style bulbs. My local home improvement store doesn’t carry any LED with GU24 base, only CFL. I looked online for them and I finally found some, but I didn’t have the funds to buy anyway. The bulbs you have (and even PAR30) would be way too big for my light fixture. The GU24 base does indeed fit your fixtures. 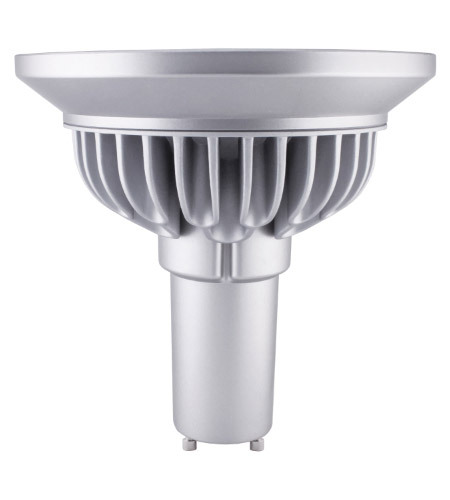 What I think what we agree on is that the PAR38 is way to large for your fixture or aesthetics. Yes, exactly that. Thanks for offering these to the community. I hope all your excess bulbs find their way into the hands of people who can use them. Boxes are in the post. Kewl, tnx! I’ll give them a good home. I can use (5) of them, all the narrow 25° type if possible. Thank you for doing this! Thanks for the beam charts. BTW your happy customer #3 shipped today. I received my box yesterday. Nice lights for sure. Well built, nice tint and cri. These will definitely light a room beautifully. Playing with all kind of ideas now how to best use them. Thank you again Ronin42. Very generous of you to give these lights away. One of the lights is slated for exploration to creat a flashlight. Began disassembly. Has an interesting looking LED that I have not identified. Has a Vf of about 30vdc when operating in the light. Has a good number of dies. Reminds me of the MT-G2 in that regard. The design should make it easy to put on copper and direct wire without traces. If I do that, I will need secure the leads so that they can not be pulled and damage the emitter. Yes, great idea! It reminds me of a Yuji COB engine but different board. I wonder who makes this LED? Does SORAA get involved at the phosphor level? A suitable boost regulator could drive this off a suitable power tool or lead-acid battery pretty easily. To my lantern I’d probably add a second control channel (with buck regulator) that drove a (few) cheap Luxeon-I-knockoff 30,000K emitter(s) for when I’m out in the boonies and want to simulate being in an abandoned mansion lit by wan rays of moonlight spilling through the windows. But maybe that’s just me. (Even though moonlight is not even close to 30,000K!) Of course 30,000K at 90+ CRI would be even better! Oh, I almost forgot. Of course there’d have to be a 3rd channel with 1900K 90+ CRI LEDs too!!! Proprietary LED technology manufactured in California, a technological breakthrough that we further enhance by focusing on every aspect of producing the most natural light possible. I’m in for 2 that are destined for the basement workshop. Got them in today. 3 days was perfect. Thank you!